A Congressional Primary race that promises to be hotter than this summer's triple digit temperatures kicked off last weekend with a successful Candidate Meet and Greet hosted by the Coryell County GOP. The event was moderated by Texas 10th Court of Appeals Chief Justice, the Honorable Tom Gray. During his welcoming remarks, Justice Gray paused to be greeted by one of the youngest of our future Republicans, a proud supporter of Mayor Dianne Costa, one of the evening's speaking candidates for Congressional District 25. The event featured short speeches of introduction by all but two of the nine declared candidates for this newly formed Congressional District. The district stretches from the southwestern portions of Tarrant County 200 miles across Central Texas to the western side of Travis County. It encompasses all or parts of 13 counties: Hays, Travis, Burnet, Lampasas, Coryell, Bell, Hamilton, Bosque, Erath, Johnson, Somervell, Hill and Tarrant. The seat is currently held by Congressman Lloyd Doggett who has retreated to a different district in an attempt to find a safer place to run. Before the candidates spoke, State Senator Troy Fraser spoke to the gathered Republicans. Sen. Fraser talked about how it is time to work hard to elect his friend Rick Perry to the White House. He said that "as a businessman, my politics are a little to the right of Atilla the Hun." Over his 14 years in the Texas Senate, Fraser has the most Conservative voting record in the Texas Senate. His solution to our current job situation is "The government should do a few things and they should do those things very well. Then they should get out of the way and let free enterprise work." He concluded with a wrap up of the last legislative session. State Representative Sid Miller also spoke to the gathering before the candidates and talked about the Sonogram Bill (currently being held up by a federal judge) and other legislation he passed through the last session of the Legislature. Miller also discussed how the media will distort the reality of what a candidate says into the "reality" they want you to hear and cited Gov. Perry's comments about Fed Chairman Bernanke's "almost treasonous" actions. With nine candidates in the race, after the meeting it was clear there were four candidates who stood out as being prepared and qualified to serve the people of this diverse district in Congress, those being (in alphabetical order) former Mayor Dianne Costa, retired USAA Executive Vice President David Garrison, Central Texas Tea Party Founder Wes Riddle and former Texas Railroad Commissioner Michael Williams. 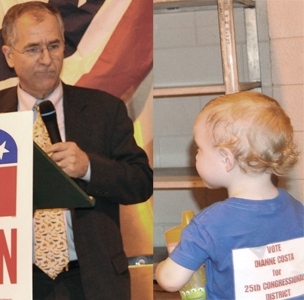 The successful event was organized by Coryell County Republican Party Chairman Ed Thompson. In addition to the talk by candidates, a fund raising dinner and silent auction was held to help fund the county's activities. Coryell County GOP's success is demonstrated by the fact that every county elected official is a Republican. Congratulations to the Coryell County Republican Party for its outstanding efforts. Republican Party of Texas SREC member "Johnny B" Rogers also expressed his support of all of the candidates present and agreed the voters of CD 25 have a great opportunity to selected a new Member of Congress from a talented field of candidates. As the event ended around 10 pm, the outside air temperature of about 103 degress reminded all present that this will be one of the hottest races in the Texas 2012 Republican Primary this coming March. As we drove through this beautiful and historic part of Texas, I was impressed by the people we met. At one stop in Lampasas, I was told by an antique shop owner that whoever gets elected to serve this district "better make some changes". At the "County Seat" restaurant, owner Mike Nott told us he had previously met Dianne Costa and was impressed with what she had to say when she addressed a board meeting of the Lampasas Chamber of Commerce luncheon earlier that week. Everywhere we stopped on this tour I was impressed with how concerned the people were about this race including one former US Army maintenance engineer Luis M. Sanchez in Killeen. Sanchez,who had been wounded in Iraq, said that as a Hispanic voter it was important to look at the conservative values of the candidates. He said this election is important and he will be voting in the Republican Primary. TexasGOPVote and I will continue to cover this race and many other of the challenging choices before the voters of Texas in the 2012 primary election. Also see Facebook comments related to this post.